Knowing how to care for an orchid can sometimes seem difficult. Orchids may look very delicate, but in reality, they are not that difficult to grow or keep alive. According to the World Checklist of Selected Plant Families there are approximately 26,570 accepted orchid species. In addition to the basic needs, there are a few more things you might need to know to help your orchid thrive. What are basic care instructions for an orchid? Keep in mind, some of the more delicate species of orchids require more light, less water, lots of humidity, and so on. If you’re growing orchids for the first time, you may want to start with a common species that doesn’t require special conditions. You can use any plant food or fertilizer to care for your orchid, but you should only use one fourth of the amount directed on the package. You can provide extra humidity to the area around the orchid by either spritzing only the leaves with a mist of water a few times or by setting the plant on top of a dish filled with moist or wet gravel. Do not nest the orchid down in the gravel as it might soak up the moisture into the growing medium and waterlog the root structure. Also, do not mist the flowers. This may cause them to mold. What growing medium do you use for an orchid? The growing medium is subject to your preferences. Typically, most growers will use either moss or ground-up tree bark. And special orchid potting mixes can be purchased. Do not use regular potting soil for your orchid. It will suffocate the roots and kill the plant. How much sunlight does an orchid need? In nature, orchids like partially shaded areas. 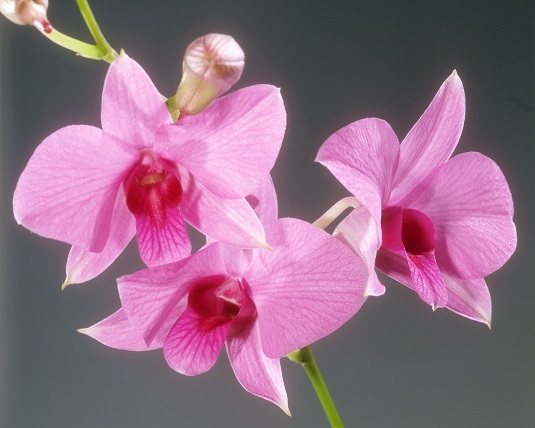 When growing an orchid indoors, it is recommended that it receive six hours of indirect sunlight a day to stay healthy. East-facing windows provide morning sunlight and the orchid will not overheat or dry out directly in the sun. South-facing windows provide sun exposure all day, but the heat is too intense for an orchid to stay healthy. With this kind of light, the plant will usually dry out and die. West-facing widows provide evening sun and, similar to south-facing windows, are too hot for an orchid to sit directly in the sun. North-facing windows do not provide enough light to keep the plant healthy. The plant will likely become droopy and will die. If the plant starts to look like its drying out and getting too much sun, try filtering the sun with a sheer curtain or moving the orchid further away from the window. If the plant starts to look droopy and over-watered but the growing medium isn’t wet or soggy, try moving the plant to a room with better sun exposure or rotating the plant from indoors to outdoors. How much water is too much water for an orchid? Watering an orchid is as easy as watering any other plant. You can tell an orchid is getting too much water if the leaves start turning yellow. There is no recommended schedule for watering an orchid. If you take a regimented approach, you will likely end up with a dead plant. The water requirements for orchids can vary based on the environment the plant is living in, its size, and the time of year. When watering the orchid, make sure to water the soil and not the plant directly. If water goes down between the leaves, it can cause crown rot. When crown rot occurs, the leaves fall off and eventually the whole plant will die. Instead of creating a water schedule, try checking the orchid to evaluate whether it needs water. Stick your finger in the growing medium or soil, and if it feels dry, water the plant. If the soil feels wet, then wait and check again in a day or two. Always water the plant just before it goes completely dry. How do you get an orchid to flower? Orchids only produce flowers once a year and the flowers bloom continuously for about a month. Some varieties bloom in winter and some in spring, but the bloom period for most orchids is around August or September. Towards the end of the bloom period you can trick the plant into blooming again by pruning the flower portion of the plant away at the node just below the first flower. If you take note of the light and water conditions and duplicate the environment, you can actually keep trimming the node to keep the plant blooming all year. What does it mean if an orchid goes dormant? If your orchid drops all of its flowers, do not be alarmed. It will bloom again in one year. If it does not bloom again, it means the plant has gone dormant. Likely, the roots are stifled and the orchid needs new growing medium. Dead roots and stems need pruned before you pot the plant. This process usually needs to be done every two or three years. The orchid should send out a new stem and flower again during blooming season. You can speed up the new growth by feeding the plant a quarter strength of fertilizer with every watering. Once the orchid is back to normal, you can cut back to regular feedings.